A new era in product oil carrier design. MARK n series which has a unique structure not found on conventional ship designs. Revolutionary in concept, the MARKII incorporates a unidirectional girder system combined with a complete double hull structure. While a ship's hull is customarily designed with a grillage of longitudinal and transverse members for strength, this system uses only longitudinal members in a double hull to provide sufficient strength. This unidirectional girder system results in unprecedented structural simplicity and completely flush surfaced cargo tank interior. MARKII product oil carriers provide unrivaled advantages in performances over more conventional designs. 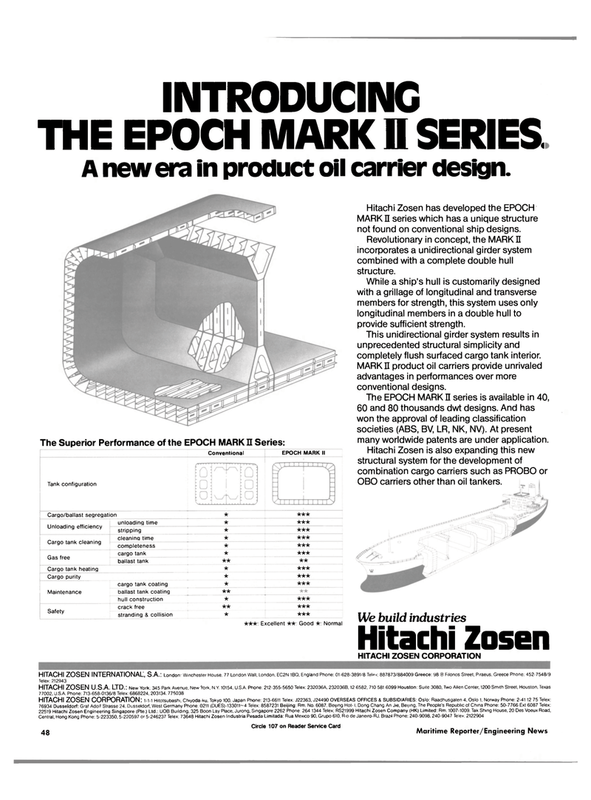 The EPOCH MARK n series is available in 40, 60 and 80 thousands dwt designs. And has won the approval of leading classification societies (ABS, BV, LR, NK, NV). At present many worldwide patents are under application. OBO carriers other than oil tankers.